"Helping Astronomers Measure The Stars Since 1979"
Optec is a design and manufacturing firm specializing in electro-optical products used in astronomy, atmospheric science and microscopy. We are located in the town of Lowell, Michigan near the banks of the Grand River. Our company is small but we utilize state-of-the-art equipment and techniques in the design and manufacture of our products. Optec provided a sneak-peak of our new focuser at NEAF 2017 in New York. Visit our booth this year to see the new low profile focuser in action. 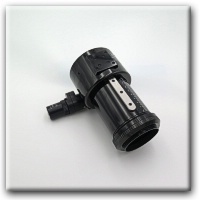 The TCF-LEO is the newest in our line of temperature compensating focusers. This thin low-profile focuser has a minimum thickness of only 1.25" and 0.35-inches of travel or about 9mm. We anticipate the TCF-LEO will help many imagers struggling with minimal back-focus on scopes such as the Celestron EdgeHD C1100. 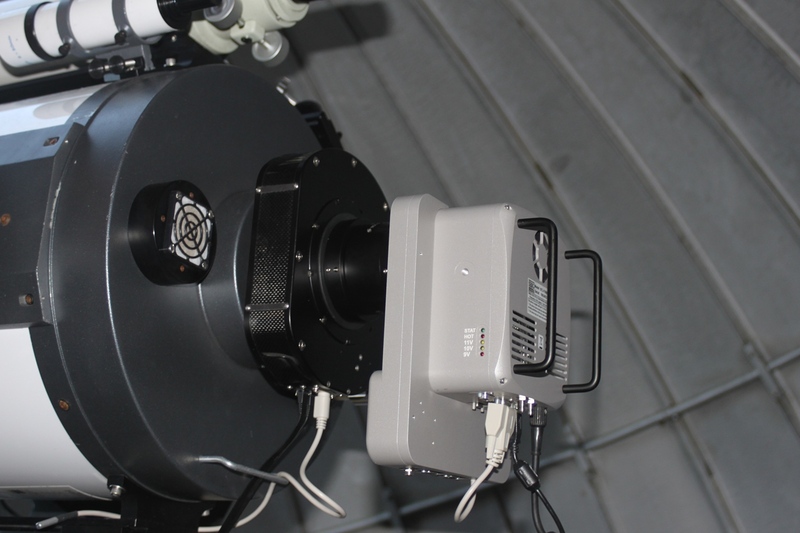 TCF-LEO is designed to fit between the mirror lock-knobs on the C-11HD and will work well with the Innovation Foresight On-Axis Guider as well as the large Perseus 3-inch port. Click here for more information. The new All-in-One ThirdLynx DirectSync SVX30 motor is an aftermarket add-on for the Stellarvue SVF25 2.5-inch and SVF30 3-inch native focusers. 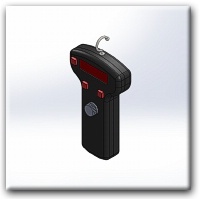 The DirectSync SVX30 includes an integrated ThirdLynx control circuit with built-in temperature sensor. The new DirectSync SVX30 motor provides a direct drive motor that can be easily disengaged for manual focusing. DirectSync SVX30 is easy to install and provides a digital focusing solution that also allows manual focus for visual observing. Fully ASCOM Alpaca and X2 compliant using our FocusLynx driver and software. Full details and pre-order here. 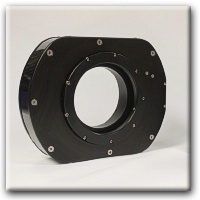 Optec engineers have designed several new DirectSync motors for the FocusLynx dual-focuser control hub. DirectSync motors replace the coarse focus knob and provide a direct geared connection to the rack and pinion. With our smooth clutch mechanism, manual focus control is preserved. Engage the motor with a simple twist of the motor housing and auto-focus is available using any ASCOM software client. 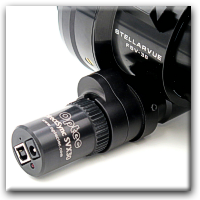 New motors include DirectSync SV35 for the new Stellarvue̓̓̓̓ 3-1/2 inch focuser, DirectSync ES25 for Explore Scientific 2-1/2" HEX focuser, and our DirectSync SW30 to fit Sky-Watcher̓̓s premium 3-inch focuser for the Esprit series apochromats. Visit the FocusLynx page for full details. We̓ve made a priority of expanding our DirectSync motor selection to include the DirectSync APO, DirectSync TEC, DirectSync ACF, and DirectSync SV for the Stellarvue. Optec has added a Fine Focus Knob to the FocusLynx Hand Control for a much better experience at the telescope. With three speeds and improved response of the IN and OUT buttons, you'll find using the Hand Control much more enjoyable for visual observing. Single handed operation allows you to adjust focus quickly and precisely without moving your eye away from the eyepiece. If you're a visual user with the FocusLynx system, you owe to yourself to try the new hand control. Contact Optec Sales to arrange return of your hand control for upgrade at a special upgrade price. Includes the latest hand control firmware and works best with the current versions of FocusLynx Commander. Guaranteed satisfaction - click here for full details or to order the upgrade. 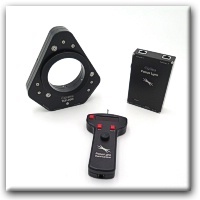 Introducing a new heavy duty combination rotator and focuser now available for purchase. Capable of handling extremely large camera loads, the Gemini Focusing Rotator will offer a level of performance unparalleled by anything in its price range. 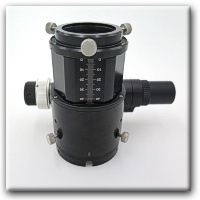 The Gemini Focusing Rotator is now available from stock! Visit our dedicated Gemini webpages for additional details and ordering information. Based upon the success of the FocusLynx Control system, the new Gemini can be controlled through serial, USB, wired Ethernet and 802.11b WiFi networks. Gemini features two stepper motors with rotation and focus in one compact device. At only 2-1/4" thickness and 1/2-inch of travel, the Gemini will fit telescopes and long camera packages that previously could not be supported. Contact us by email (sales@optecinc.com) or join the Optec Yahoo Group for notifications as details become available. Developed in partnership with Innovations Foresight, Optec's new FocusLock software integrates patent pending SharpLock Technology to provide an easy-to-use focusing application that functions whenever guiding is active. SharpLock has received a Sky & Telescope Hot Product award for 2016. 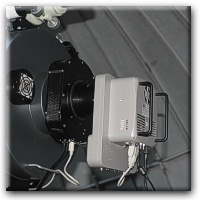 When using the ONAG On-Axis Guider a cold-mirror passes infrared light to the guide camera while reflectiing visible wavelengths on to the imaging camera. The cold-mirror introduces a slight astigmatism to the guide image allowing FocusLock to quickly determine on which side of focus the camera is currently positioned. 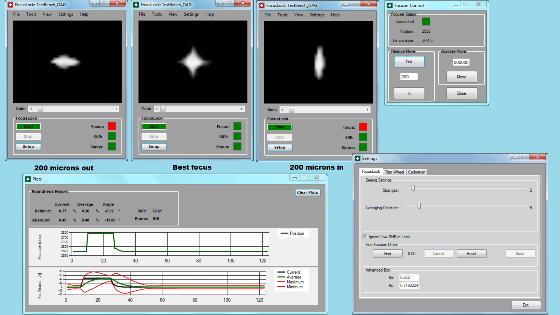 Using the proprietary SharpLock technology, FocusLock can be used to quickly drive the focuser to the optimal focus position and maintain focus for weeks or months at a time. UPDATED VERSION 1.0.2 NOW AVAILABLE. Full details and Download links available on the FocusLock webpage. Optec engineers have developed a new focus control circuit designed to fit the endcap of our DirectSync motors. The new "X" series motors will include our Third Lynx internal controller with USB connectivity. Optec has released a new DirectSync motor for the FocusLynx system. The #19782 DirectSync SW30 motor fits the 3-inch focuser on the Sky-Watcher Esprit 100, 120, and 150mm Apochromats. Fully compatible with the FocusLynx Dual-Focus Control System, this new focus motor offers the same smooth clutch system available with QuickSync and other DirectSync models. Visit the DirectSync SW30 page for a full compatiblity listing or to order today. In January, Microsoft released a patch to Windows 10 that is causing problems for many ASCOM drivers. Bob Denny, author of ACP, owner of DC3 Dreams, and ASCOM Developer Extraordinaire has described a fix for the problems arising out of this new patch. Our senior programmer, Daniel Van Noord, explains how the Optec ASCOM drivers and programs are affected here. Optec has joined the 21st century by adding Facebook page. Please take a look and share your favorite astrophotography shots taken with Optec equipment. Sky & Telescope 2019 Hot Product! Optec's TCF-Leo has been selected as one of the Hot Products for 2019 by Sky & Telescope magazine. This prestigious award is presented to new products that "introduce new technologies or processes, provide a solution to an old problem, or simply delivery exceptional value." Visit the TCF-Leo page to learn more about this unique, robust low-profile Temperature Compensating Focuser.